You don’t have to be the queen or king of crafts to make your own centerpiece. Using a few gel clear water beads and some fresh flowers, you can create a unique and inviting centerpiece for your dining room table. This easy and inexpensive centerpiece would even work for weddings and formal parties. You can even give them as a house warming gift. Once you get down the basic idea of using the gel clear water beads, you get a little bit more creative. You can try multicolored water beads, or even a colored Tea Light candle instead. 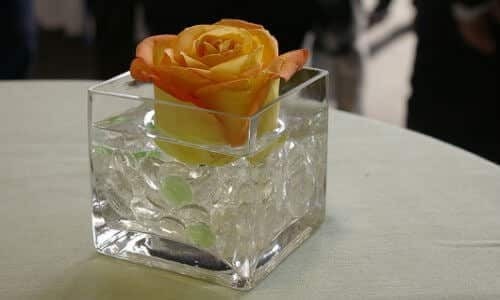 You can also submerge fresh cut flowers into water with your gel water beads. But for now, here are the instructions on how to make a simple yet beautiful gel clear water bead flower arrangement. Soak the gel clear water beads for about five hours. These beads start out as hard pellets, but once you soak them in water they expand into pretty shimmering and decorative beads. Once you’re done soaking them, drain the water and rinse off the gel clear water beads. Pick out your clear glass case and fill it up with your gel clear water beads. You can submerge you waterproof Tea Light candle into the beads. Trim down and gather you flowers that you’ve chosen for your flower arrangement. You can keep it simple and just use a single rose, or pick out a selection of colorful flowers to arrange in the vase. Before you place your centerpiece in the middle of the table, place a gold table runner on your dining room table. Whether you are hosting an intimate dinner party or creating a wedding tablescape, a gold table runner will look beautiful with your floral water bead centerpiece.